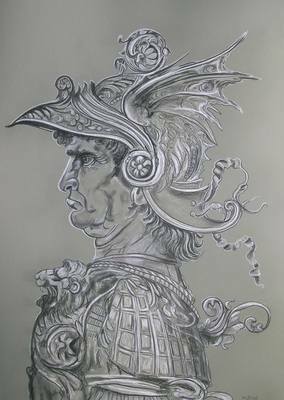 HIGH PRESTIGE EXHIBITION STANDARD PASTEL RENDITION OF DA VINCI'S FAMOUS DRAWING "Warrior" . BY THE FABULOUS ARTIST DAVID ALDUS. This lovely large monochromatic pastel of Da Vinci's "Warrior"!! Highest price received for one of his paintings is £20,000 "Armada under attack from english fleet, £14,000. "Lot's Wife" Absolute investment opportunity! The original sketch is in the British Museum and measures 12.3 cm. x 18 cm. Even in this small size it carries tremendous power. Aldus has enlarged it to 112 cm. x 82 cm., which is life-size, and the result is galvanic. When entering the room where it is displayed it is impossible to ignore the ornately armoured warrior. The larger image has a life of its own. There are several inspirational sources that led Aldus into this unique treatment of Leonardo's work. One comes from his childhood when his headmaster recited a poem by Lord Byron. Aldus has forgotten its title, but still remembers a rhyming couplet which accords well with his 'Warrior'. After thundering several stanzas, his headmaster roars out the following rhyming couplet - "The Assyrian came down like a wolf on the fold, His helmet a-gleaming, his spurs made of gold". The image it conjured in Aldus's mind has stayed with him to this day. When he saw the tiny sketch of Da Vinci's warrior he felt it fulfilled all the drama and chutzpah of that Assyrian warrior and conveys the couplet's bravura and braggadocio. Byron must have been affected by the poem because he travelled to Greece to help fight the invading Turks, and died there. A word about the medium Aldus has used. It is black charcoal and white chalk. These two pastels are non-fading and will endure for centuries. A fact which pleases Aldus. He has 'fixed' the pastel image which means it can be touched, if need be. So, we have three artists involved in the creation of the life-size warrior - da Vinci, who made the first minuscule sketch; Byron, who wrote the poem's couplet; and Aldus who saw the power in da Vinci's sketch and enlarged it to its present magnificent image. It could well mark the resurgence of Renaissance values and techniques!! David Aldus the artist has exhibited with the Royal Society of British Artists ( R.B.A ); the Royal Institute of Oils (R.O.I); and the Royal Society of Marine Artists (R.S.M.A) He has been nominated twice as a finalist in the Garrick/Milne prize exhibition held at Christies LONDON. His work has been selected for the Discerning Eye Exhibition by Art Critic, Edward Lucie Smith, where all his work was sold. At the same Exhibition he was awarded a special commendation for his brushwork. He also sold all his work at the Lambeth Palace when exhibiting under the auspices of the Royal Society of Marine Artists. At the Westminster Central Hall United Artists' Exhibition he won first prize for the best Oil painting!! Highest price received for one of his paintings is £20,000 "Armada under attack from Englsih fleet" Also £14,000. "Lot's wife" see davidaldus.com . This painting was the same size as Turner's Hannibal crossing the Alps 5 foot by 8 foot. David Aldus also sold "A tribute to the people of Malta" that sold for £10,000. The same painting was the subject of a congratulatory letter from Queen Elizabeth II. Lord Lewin, Admiral of the Fleet also sent a letter of congratulations. He has held one or two-man shows at Knightsbridge; South Kensington; Windsor and numerous other venues. He has exhibited in Westminster Central Hall; Royal Festival Hall; Birmingham’s Royal British Artists exhibition; Victoria Art Gallery, Bath; Rooksmoor Gallery, Bath; London Guildhall; Mann Island, Liverpool; Christies, the London Auction House, etc.